Shoppers waiting for a Target to open at midnight on Black Friday last year. This year the stores will open at 9 p.m. on Thanksgiving. Target announced Monday it will open at 9 p.m. Thanksgiving evening, the earliest it's ever started its Black Friday sales. 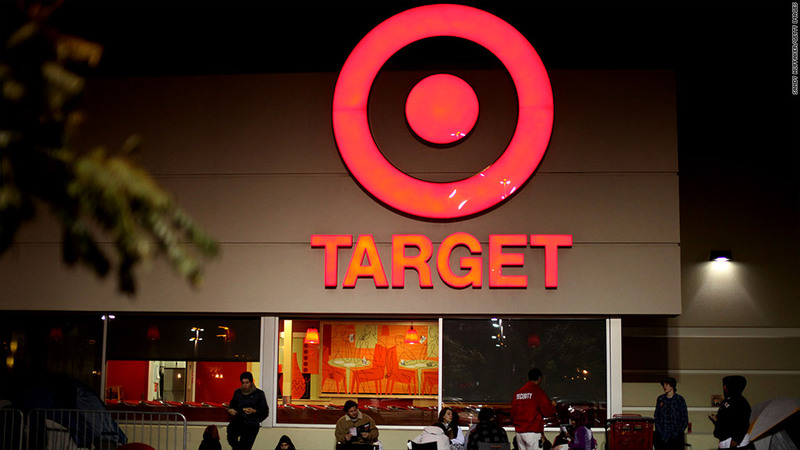 Last year, Target opened at midnight on Thanksgiving night. "We heard from our guests that they look forward to kicking off their holiday shopping with deal-hunting on Thanksgiving night," said Kathee Tesija, executive vice president, merchandising, for Target. "Opening at 9 p.m. gives Target's Black Friday guests a more convenient way to create an after-dinner shopping event that the entire family can enjoy." But Target (TGT), the nation's No. 2 retailer, won't be beat by it's larger rival Wal-Mart (WMT), which this year has moved its opening to 8 p.m. from a 10 p.m. last year. Not only are stores opening earlier, but they're coming up with different sales to keep shoppers at their stores longer, according to Brad Wilson, editor in chief of BlackFriday2012.com. For example, Target will have some specials that won't start until 4 a.m. on Black Friday, including a Samsung 50" LED HDTV for $699, a Canon A3400 Camera Bundle for $89.99, Fisher-Price Doodlepro Classic for $10, Leapfrog Explorer Software for $15 and a $10 gift card for shoppers who spend $50 or more on clothing. Wal-Mart is adding another twist to its Black Friday sales, guaranteeing that everyone in its stores between 10 p.m. and 11 p.m. Thanksgiving night will receive one of the three big deals: an Apple (AAPL) iPad2 and a $75 Wal-Mart gift card, for $399.99, an LG Blu-Ray player for $38, or a 32-inch Emerson (EMR) HD TV for $138. Stores generally only have a handful of their big sale items online, which means that many customers that come in with the hope of scooping them up miss out, but end up buying other items. "Wal-Mart is taking items they're going to lose money on and not limiting the inventory like every store has forever," Wilson said. "I doubt anyone else will try to match that. It'll hurt Wal-Mart less than anyone else because their scale and margins are better." While Target doesn't offer same type of in-stock guarantee, some of its sale prices are nearly as competitive. Its iPad2 is also $399.99, and comes with a slightly less generous $60 gift card. (On Apple's web site, the iPad2 starts at $399). Over the weekend, toy retailer Toys R Us announced it too will open at 8 p.m. on Thanksgiving. But not every store is moving their opening up. Electronics giant Best Buy (BBY) still plans to open its stores at midnight, said spokeswoman Erin Bix. "Black Friday offers will be available online on Thursday. We wanted to have the balance to give our employees time with their loved ones on the holiday," said Bix. Best Buy's deals include deep discounts on flatscreen TVs, as well as a Toshiba WiFi Blu-ray player for $39.99, a Samsung Galaxy tablet with a $20 Best Buy gift card for $179 and a Nikon Coolpix 12.1 megapixel camera for $129.